Possibly northern Italy or Germany, ca. 1225-1250. Purchase; Richard E. Priest; 1994. Tammaro De Marinis; purchased from De Marinis by Bernard Rosenthal, San Francisco, California, in 1963; Rosenthal Catalogue 23, no. 82 (1971), repr., purchased by Richard E. Priest from Rosenthal in 1973; Priest MS 3; purchased from Priest in 1994. Ms. martyrology; written in northern Italy? Germany?, second quarter 13th century. Decoration: red and blue, red and greeen puzzlework initials. 1 table (fol. 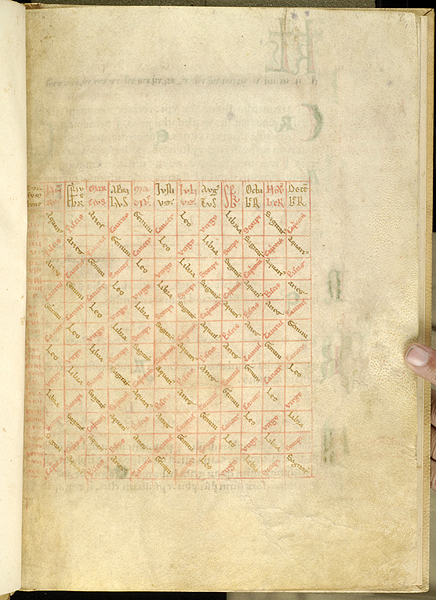 1) in red and brown ink with names of Zodiac signs written in criss-crossed diagonal lines, used to determine the position of the moon in the Zodiac.